he many thousands who have laughed over the inimitable Artemus Ward's essays in natural history, such as "The elephant has four legs—one on each corner; he eats hay and cakes," might little suspect the analogy which exists between these humorous trifles and the serious works of the zoological pundits of the seventeenth century. If anything, far greater is the humour to be extracted from the older writers; especially when we recollect that their books and treatises on animal creation were regarded with infinite respect—veneration even—by young and old, wise and unwise, noble and plebeian, who diligently consulted them. Unhappily, most of these productions are in Latin, and even Artemus Ward in Latin would probably lose the fine savour of merriment by which his good things are distinguished unless the translator relied upon puns, as they do in the Westminster plays. But the pictures in Aldrovandus, in Albertus Magnus, in Johannes Jonstonus, and in Conrad Gesner speak—shall we not rather say, shriek?—for themselves; and we were recently fortunate in coming across a large volume in which the best in all these books is gathered together, with English letterpress, for the benefit of a young English prince who lived and died early in the seventeenth century. 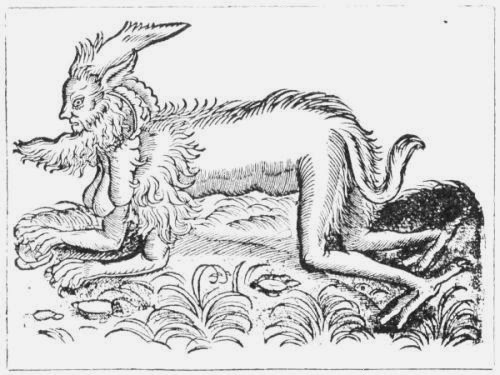 It was in 1607 that Edward Topsell published his version of "Four-footed Beastes." Gesner's chef d'œuvre and those of the other writers named had been on the bookshelves for many years. The volume in question belonged to the eldest son and heir of James I., and has his coat of arms on the cover. Next, it enjoys the distinction of having some of the plates coloured by the Royal hand, its owner being then in his thirteenth year. But, best of all, its pictures and letterpress describe for us beyond the possibility of error, and in the clearest and most perspicuous way, the wonderful quadrupeds which flourished on the face of the earth in Prince Henry's boyhood. Beside this curious volume how tame are even the most interesting of modern natural history books! Let us begin with the king of beasts. "Lyons bones have no marrow in them and are so hard that they will strike fire. Their neck is made of one stiffe bone, without any vertebras. They have five claws on the hinder feet and the balls of their eyes are black. Lyons eat but once in two days and drink in like manner. Formerly in England a Lyon could tell noble blood from base." Can it be that this virtue was confined merely to the lions caged in the Heralds' College? Our Beast Booke goes on to inform us that in certain districts lions were killed, not with spears or cannon-balls, but "with the powder of decayed fish." From whence may we not have a faint glimmering of the reason why Jamrach's was originally situated so much nearer to Billingsgate Market than to Piccadilly? "THERE IS A VARIETY OF LYON WITH HUMAN FACES." "There is a variety of Lyon with human faces. As for the rest, the taile of a Lyon is very long, which they shake oftentimes, and by beating their sides therewith they provoke themselves to fight. 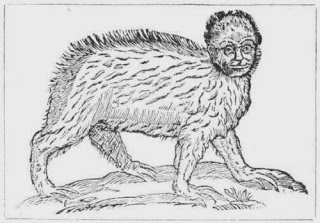 The nether part of this taile is full of hairs and gristles, and some are of opinion that there is therein a little sting wherewithall the Lyon pricketh itselfe." "The Lamia is a wild Beast, having several parts outwardly resembling an Oxe and inwardly a mule. The Lamia has a woman's face and very beautifull, also very large and comely shapes such as cannot be imitated by the art of any painter, having a very excellent colour in their fore-parts without wings, and no other voice but hissing like Dragons; but they are the swiftest of foot of all earthly beasts, so as none can escape them by running." "THE LAMIA HAS A WOMAN'S FACE AND VERY BEAUTIFULL." The chief prey of the Lamia was, it appears, members of the human species, preferably males. By its passing beauty (or, to judge by the pictorial illustration, one would say rather by its amazing novelty) it would entice men, and when they had "come neare, devoure and kill them." In fact, these lamias were so inordinately fond of their favourite refreshment that in one district "a certain crooked place in Libia neare the Sea-shore full of sand was like to a sandy Sea and all the neighbor places thereunto are deserts." A painful and humiliating lack of men has often been noticed at our modern seaside resorts. 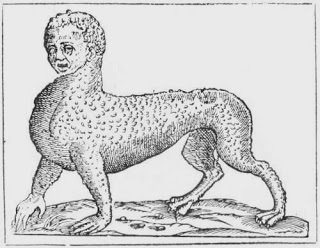 "The hinder parts of this beast," concludes our author, "are like unto a goate, his fore-legs like a Beares and his body scaled all over like a Dragon." Next is a contemporary picture of a Tiger. And now we come to the Wolf. His custom in those halcyon days of natural history was, as now, to go in troops. But we read: "Their necks are pressed together, so that they cannot stir it, to look about, but they must move their whole bodies. They fall upon their prey, devouring hair, bones and all. When they are to fight in great herds they fill their bellies with earth." But this is as nothing. "When they are to pass over Rivers, they joyn tails; loaded with that weight they are not easily thrown down and the floods can hardly carry them away, being joined together. The breath of a Wolf is so fiery, that it will melt and consume the hardest bone in his stomack." We have all of us heard of the Harpy. Below is a likeness of one that speaks for itself. Lizards are always interesting. 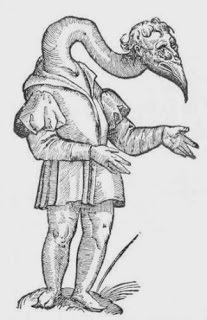 "There was a lizzard 8 cubits long brought to Rome from Ætheopia by the command of a Cardinal of Lisbon and the mouth of it was so wide that a child might be put into it.... Put alive into a new earthen vessel and boyle'd with 3 Sextaryes of Wine and one Cyathus, it is excellent food for one sick of the Pthisick, if he drink of it in the morning fasting." We must not suppose that this operation would kill the lizard; the difficulty would be how to procure a vessel to stew so large a lizard. Lizard-pots are made much smaller nowadays. We dare say that the worthy Mrs. Beeton, in her most ingenious moments, never dreamt of one above four, or at most six, cubits deep. Writers of our own time who have never gone in for a course of logic rarely condescend to complete perspicuity. They take things too often for granted. This is not old Topsell's way. "The Arabian sheep have a very broad tail," he says, "and the fatter it is the thicker it will be." We learn, too, what we should never have suspected had the author not plainly stated it, that some tails "have been seen above 150lbs. in weight." 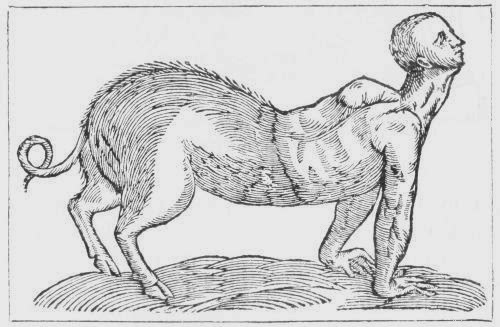 Albertus Magnus saw "a Ram that had 4 great Horns growing on his head and two long ones on his legges, that were like to Goat's Horns." "Subus is an amphibion, with two Horns: he follows shoals of fish swimming in the Sea, Lobsters, Pagri, and Oculatae, are fishes that love him; but he cares for none of their love, but makes them all his prey. 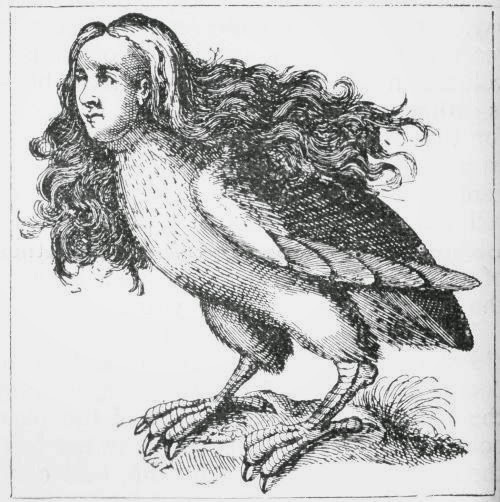 "The Sphinx or Sphinga is of the kinde of Apes, having his body rough like Apes, having the upper part like a woman and their visage much like them. The voice very like a man's, but not articular, sounding as if one did speak hastily or with sorrow. Their haire browne or swarthy colour. They are bred in India and Ethyopia. 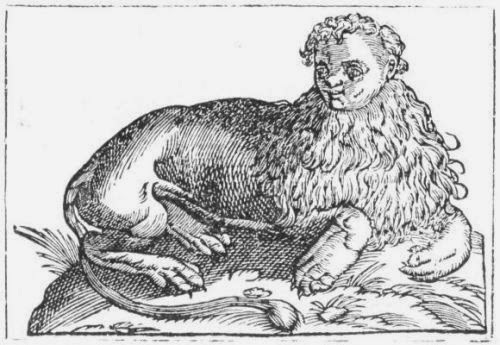 The true Sphinx is of a fierce though a tameable nature and if a man do first of all perceive or discerne of these natural Sphinges, before the beast discerne or perceive the man, he shall be safe; but if the beast first descrie the man, then is it mortal to the man. 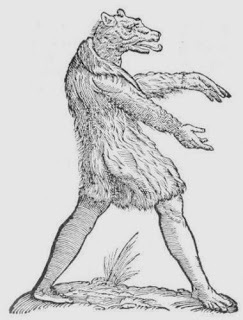 "The Mantichora is bred among the Indians, having a treble row of teeth beneathe and above, whose greatnesse, roughnesse and feete are like a Lyons, his face and ears like unto a mans, his eyes grey and collour red, his taile like the taile of a scorpion of the earth, armed with a sting, casting forth sharp pointed quills, his voice like the voice of a small trumpet or pipe, being in course as swift as a Hart." Then follows further description of the Mantichora. This singular combination of lion, man, scorpion, and porcupine was implicitly believed in by all the natural history writers up to Goldsmith's day, and we are not sure that that pleasing but gullible scribe did not, privately at least, accord its existence full credence. Leigh Hunt, in his Autobiography, describes the extraordinary effect which a sight of this beast had upon him when he encountered it in an old folio during his childhood. The Mantichora, he says, "unspeakably shocked me. It had the head of a man, grinning with rows of teeth, and the body of a wild beast, brandishing a tail armed with stings. 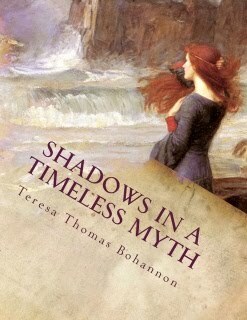 It was sometimes called by the ancients Martichora. But I did not know that. I took the word to be a horrible compound of man and tiger. The beast figures in Pliny and the old travellers. Appolonius takes a fearful joy in describing him. 'Mantichora,' says old Morell—'bestia horrenda'—'a brute fit to give one the horrors.' The possibility of such creatures being pursued never occurred to me. Alexander, I thought, might have been encountered while crossing the Granicus, and elephants might be driven into the sea, but how could anyone face a beast with a man's head?" Leigh Hunt goes on to describe how the Mantichora impressed his whole childhood. Doubtless the sensations of the eighteenth-century child were the same felt by the early seventeenth century Prince Henry. The Mantichora was the bête noire of the Royal nursery, we may depend upon it. Scarcely less dreadful was the Collogruis, whose picture is given on the next page. How many of us have heard of the Colus? "There is," we read, "among the Scithians and Sarmatians a foure-footed wild beast called Colus, being in quantitie and stature betwixt a Ramnie and a Hart and dusky white coloured, but the young ones yellow." 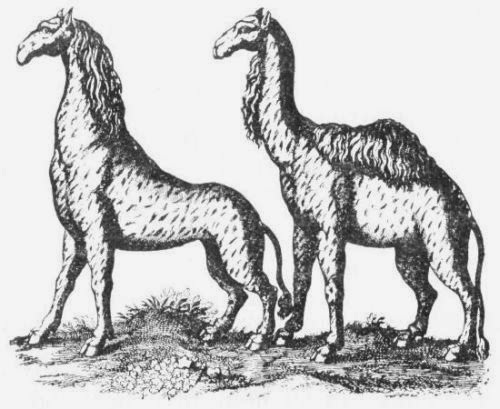 The real peculiarity of the Colus, which makes every true lover of quadrupeds regret its extinction, is described as follows: "Her manner is to drinke by the holes in her nostrils, whereby she snuffeth up aboundance of water and carrieth it in her head, so that she will live in dry pastures remote from all moisture and great season, quenching her thirst by that cisterne in her head." Imagination conjures up a huge drove of Colii, blissfully encamped in the midst of the Sahara, astonishing the passing Bedouins by their sagacity and the amazing cisterns in their craniums. There was no use trying to capture them, so fleet and nimble were they, unless, indeed, the hunter had taken the precaution to arm himself with a flute or a timbrel. In that case he had only to strike up a few airs and it was all up with the poor Colus. He would fall down with weakness, and a simple blow with a staff sufficed to dispatch him. He made excellent eating; flavoured, we suppose, by the contents of the cranial cistern afore described. "The Camelopard or Giraffe is a beaste full of spots. He hath two little hornes growing on his head the colour of iron, his eies rolling and growing, his mouth but small like a hart's; his tongue is neare three foot long. The pace of this beast differeth from all other in the world, for he doth not move his right and left foote one after another, but both together, and so likewise the other, whereby his whole body is removed at every step or straine." We must perforce skip the descriptions of the three kinds of Apes—Ape Satyre, the Ape Norwegian, and the Ape Pan. Then there are such creatures as the Axis, the Alborach, the Cacus, the Allocamell, and the Tragelaphus. And how shall we tell of the Dictyes, the Crucigeran, the Gulon, and the Gorgon? Then there are dissertations on those fearful quadrupeds the Orynx and the Tarbarine. But the Poephagus ought to detain the modern student a moment, as it must often have engrossed Prince Henry by the hour. 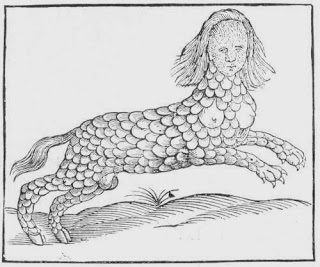 "This great beaste whose everie hair is two cubitts in length & yet finer than a man's, is one of the fearfullest creatures in the World: for if he perceive him to be but looked at by anybody he taketh to his heels as fast as he can goe." The cause of his fright is his tail, which is much sought after by the natives to bind up their hair. When the hunted Poephagus can "no longer avoyde the hunter then doth he turne himselfe, hiding his taile, & looketh upon the face of the hunter with some confidence, gathering his wits together, as if to face out that he had no tayle, & that the residue of his body were not worth looking after." Sly Poephagus! But his stratagem is in vain. For "they take off the skinne and the taile," perhaps not even killing him, and so leaving the luckless Poephagus to go roaming about the country skinless and tailless—a piteous sight. But stay. "Volateranus relateth this otherwise, that the beast biteth off his own taile and so delivereth himself from the hunter, knowing that he is not desired for any other cause." Can we not conjure up the scene for ourselves? "Hunter: So sorry to trouble you, but your taile or your life! "Poephagus: No trouble at all, I assure you. Allow me (bites off his taile). Pray accept it with my compliments (hunter bows and retires)." 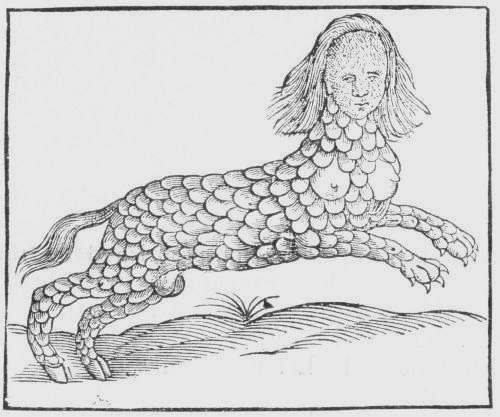 "The Neades were certain beastes whose voice was so terrible that they shook the earth therewith," but the Strepficeros, though endowed with a more resonant title, was a very simple, inoffensive quadruped after all. 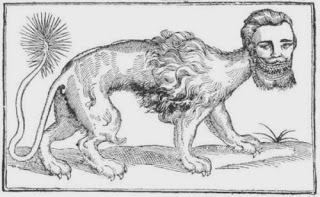 "The Cepus was a four-footed beast having a face like a Lyon & some part of the body like a panther, being as big as a wild goat or Roe-buck, or as one of the dogs of Erithrea & a long taile, the which such of them as having tasted flesh will eat from their own bodies." "The Calitrich had a long beard and a large taile." You perceive the early naturalists set great store by an animal's caudal appendage. It gave them scope for their descriptive powers. And now let us learn something about the Cynocephale. "The Cynocephales are a kind of Apes, whose heads are like Dogges & their other part like a mans. Some there are which are able to write & naturally to discerne letters which kind the Priests bring into their Temples, & at their first entrance, the Priest bringeth him a writing Table, a pencil & Inke that so by seeing him write he may make by all whether he be of the right kind & the beast quickly sheweth his skill. The Nomades, people of Ethiopia & the nations of Mentimori live upon the milk of Cynocephals, keeping great heards of them, & killing all the males." "The Elk is a four-footed beast commonly found in Scandinavia. His upper lip hangs out so long that he cannot eat but going backwards. He is subject to the falling sicknesse, the remedy he hath is to lift up the right claw of the hinder foot & put it to his left ear. It holds the same virtue if you cut it off." Of the ram we are told that "for six winter months he sleeps on his right side; but after the vernal equinoctiall he rests on his right. Ælianus hath discovered this, but the butchers deny it." "The Camel hath a manifold belly, either because he hath a great body: or, because he eats Thorny & Woody substances, God hath provided for the concoction. Puddle water is sweet to him, nor will he drink river water, till he hath troubled it with his foot. He lives a hundred years, unlesse the Ayre agree not with him. When they are on a journey they do not whip them forward: but they sing to them, whereby they run so fast that men can hardly follow them." Modern zoologists must regret the extinction of the sixteenth-century She-goat, which, according to Prince Henry's natural history, "see as well by night as day, wherefore if those that are blind in the night eat a Goats liver they are granted sight. They breathe out of their eares and nostrils." "The Beaver is a most strong creature to bite, he will never let go his teeth that meet, before he makes the bones crack. His hinder feet are like a Gooses and his fore-feet like an Apes. His fat tail is covered with a scaly skin, & he uses for a rudder when he pursues fish. He comes forth of his holes in the night: & biting off boughs of Trees about the Rivers, he makes his houses with an upper loft. When they are cut asunder they are very delightsome to see; for one lies on his back & hath the boughs between his legges & others draw him by the tail to their cottage. "A Baboon is a Creature with a head like a dog, but in shape like a man; he will fish cunningly, for he will dive all day, & bring forth abundance of fish." 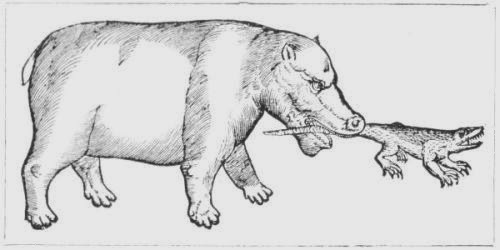 Here is a picture of a Hippopotamus or Sea-Horse devouring a crocodile tail first. A HIPPOPOTAMUS DEVOURING A CROCODILE. "The Elephant is a stranger with us, but that the Indians & other places have them in common. The King of the Palibroti had 90,000 of them. Many strange things are spoken of them. It is certain that of old time they carried Castles of armed men into the Field. In his heart, says Aldrovandus, he hath a wonderful big bone. Aristotle maintains that he hath three Stomacks. It is most certain (continues the careful chronicler) that in the Kingdom of Malabar they talk together, & speak with man's voice. There was, saith Ocafta, in Cochin an Elephant, who carried things to the Haven & laboured in the sea-faring matters: when he was weary the Governor of the place did force him to draw a galley from the Haven which he had begun to draw, into the sea: the Elephant refused it the Governor gave him good words, & at the last entreated him to do it for the King of Portugal, thereupon (it is hardly credible) the elephant was moored, & repeated these two words clearly, Hoo, Hoo, which in the language of Malabar is, I will, I will, & he presently drew the ship into the Sea.... They learn things so eagerly that Pliny says that an Elephant that was something dull, & was often beat for not learning well, was found acting his part by moon-light, & some say that Elephants will learn to write & read. One of them learned to describe the Greek letters, & did write in the same tongue these words, I myself writ this." "But," concludes the zoologist, conscious of having clinched the matter by this last proof, "I will say no more." "The Ichneumon is a creature in Egypt with a long tail like a Serpents. He is an enemy to the Crocodile; for when he observes him sleeping he rolles himself in clay, & goes into his mouth, & so into his belly & eats his liver, & then leaps forth again." Loaded with all his zoological learning we can understand how Prince Henry became a very bright little boy, far in advance of his years. We can also dimly perceive why he died so young. It is not given to every youth—nor to every prince—to devour such marvels and live in peace and content at home or at Court, surrounded by the conventions of everyday English life. But had he survived this accumulation of wisdom, the realm would surely have boasted under King Henry IX. a "Zoo" compared with which our present establishment, excellent as it is, would have been paltry indeed. But it is too late to repine. The mantichora, the lamia, the gryphon, and the poephagus are presumably extinct, while as for our lions, bears, giraffes, and the rest of the "foure-footed beastes," these appear to have miserably abandoned all those curious traits which rendered them glorious in little Prince Henry's days, and which, we trust, will long reflect lustre on their past.